The challenge to myself was to incorporate rosemary into a complete meal. The garden in my backyard has mint, basil, and rosemary but I probably use rosemary the least. So here's how I got more acquainted with this herb. The best way to tackle a new ingredient is to combine it with other ingredients that you know well, in my case, garlic and potatoes. 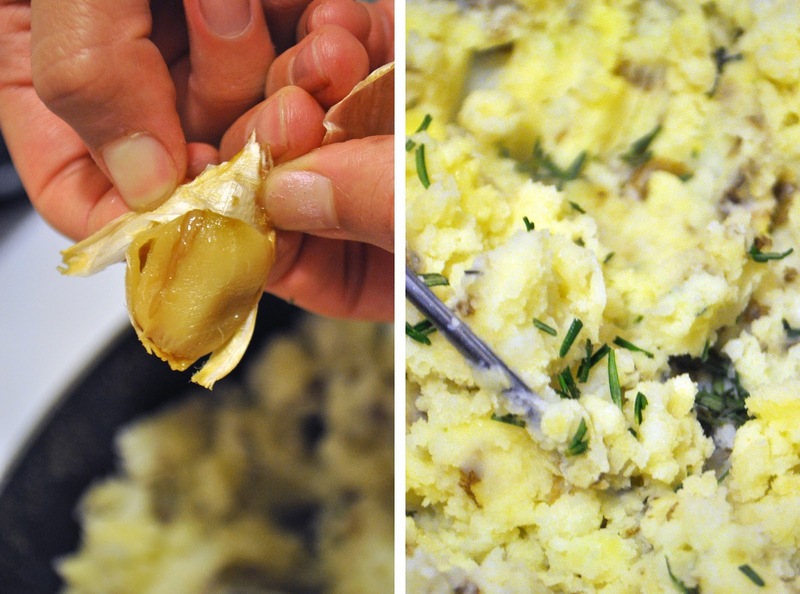 Start by peeling a head of garlic down to the last layer of skin on the individual cloves. Wrap the garlic in a foil pouch, leaving some air/breathing space for the garlic and bake it on 450 degrees F.
By this time the garlic should be ready. Remove them from the oven and open the pouch to let them cool. 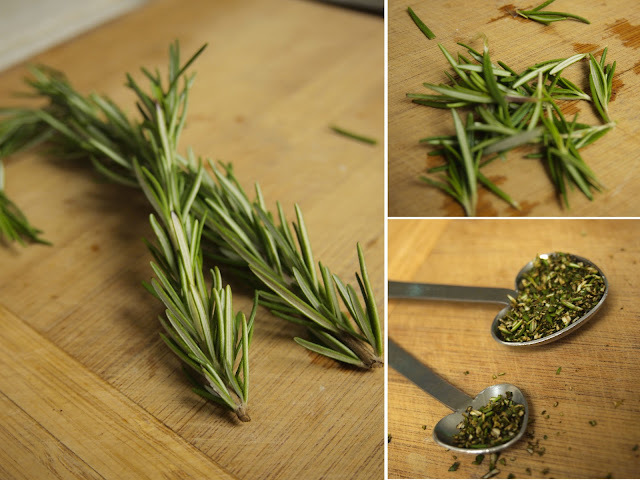 Chop up the rosemary. Begin mashing the potatoes and add the butter 1 tbs at a time to let it melt and incorporate into the mash evenly. In between adding the butter add in the rosemary, garlic by peeling off the last layer of the skin, and stock to make the mash more creamy. Done. Somewhere in between all of this, mainly while I was waiting for the potatoes to cook, I also prepared this super easy and aromatic cod dish. 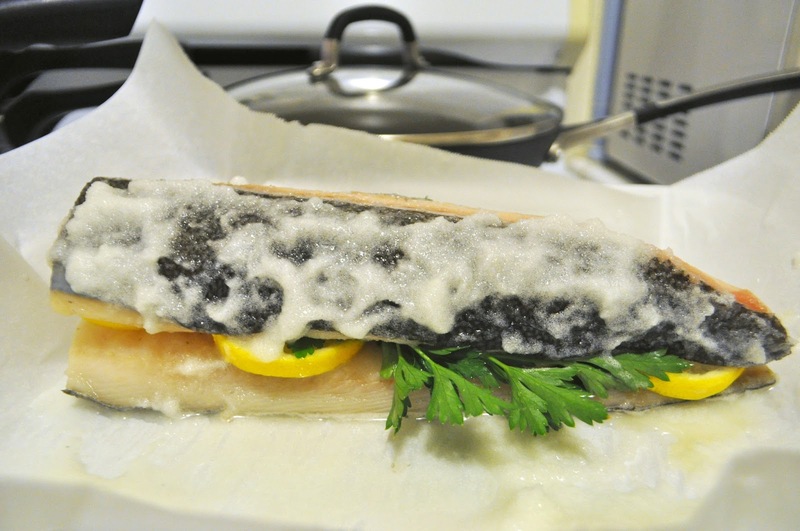 If the fish is frozen then defrost it first. Preheat your oven to 450 degree F, or in my case I just used the oven after the garlic for the mashed potatoes were done. In a bowl, mix the salt and egg white together until the consistency is like wet sand. Rinse and pat the fish dry and place it on a parchement paper lined baking sheet. Firmly rub the salt mixture onto the skin side of the fish. 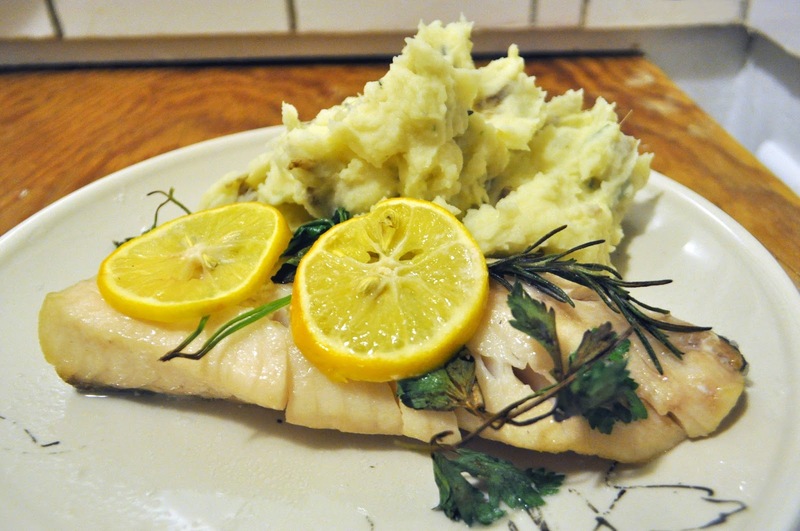 Then place the herbs, garlic, and lemon slices in between the two fillets to make a sandwich. Bake the fish until the salt becomes a tlittle charred and golden at the edges, around 25 minutes. 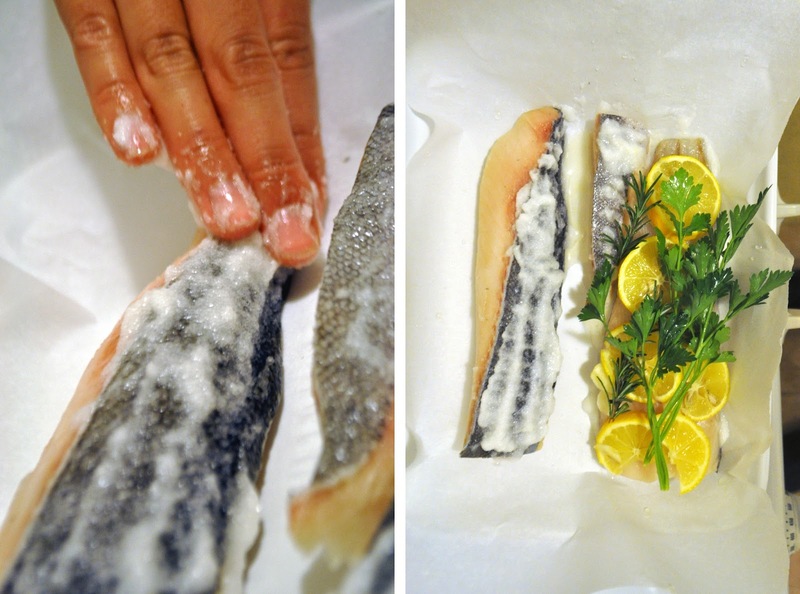 Remove the fish, discard the salt crust, and plate. Serve it with the mashed potatoes on the side for maximum enjoyment! I love the smell of rosemary, and I've used it most often to cook chicken and other meat. I thought it would be an interesting juxtaposition with sweets, so I found a dessert recipe to try on 101 Cookbooks. I am a nondiscriminatory lover of all baked goods, but I think shortbread is one of the best kinds of cookies. 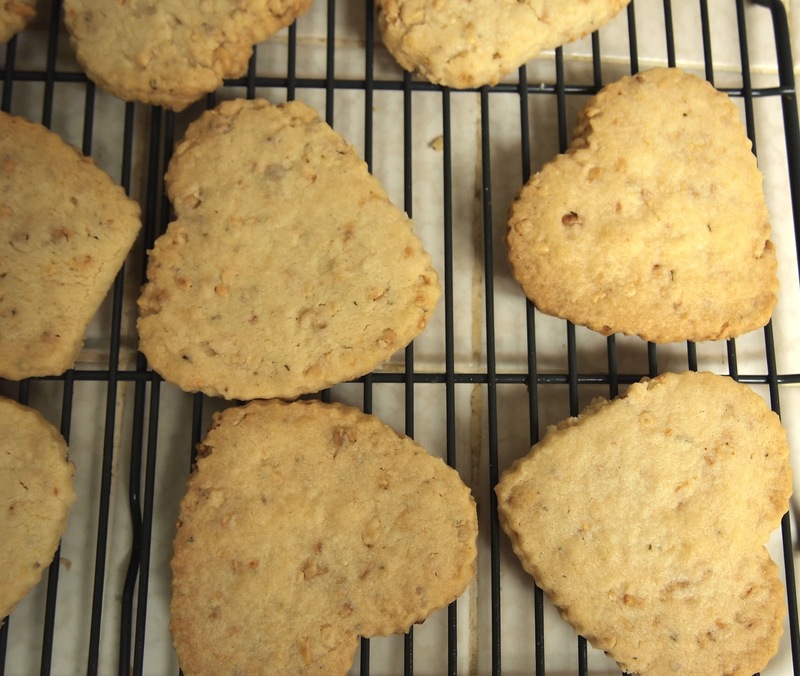 Not the dry disgusting shortbread from tins, but really tasty and crumbly shortbread. From my Christmas cooking, I had exactly enough pine nuts left too, so I thought it might be a sign to try the recipe. -I used unbleached all-purpose flour and regular sugar. -I don't think I mixed the flour and salt well enough. The saltiness really contrasted well with the sweetness, but it was unevenly distributed in my dough. -I omitted the lemon zest because I didn't happen to have a lemon in my fridge. Didn't miss it. -The dough is super crumbly, so I recommend sticking it back in the freezer, as suggested at the end of the recipe. Otherwise, you'll end up with lots of broken hearts. Trust me, you don't want to be singing "Don't Go Breakin' My Heart" for the rest of the day, like I was. Overall the cookie is delicious! I would definitely reduce the amount of sugar if I were to make it again. P.S. Do you like my new cup? You can't tell in the photo but it has a gold bottom! Swooon. My sister bought me a set for Christmas!